Initially the sugar plantations were dependent on irrigation systems that used massive pumps to lift rainwater up to 650-feet from artesian wells along the coast to the level of the plantations. This was a very expensive proposition and most likely required a great deal of maintenance. So the idea of building a dam became very attractive. Leonard Grant (LG) Kellogg had settled in the colony of Wahiawa, which was primarily engaged in pineapple farming. He organized the Wahiawa Water Company with the purpose of providing drinking water and irrigation to the colony. The company constructed a ditch from a local water source to the colony. The Wahiawā Colony Tract covered an area of 1,300-acres. The homesteaders formed an agricultural cooperative called the Hawaiian Fruit and Plant Company; later, they set aside the central town lots for the use and benefit of the Settlement Association of Wahiawā resident landowners. Within a few years, Wahiawā Town was underway. In 1902, LG called in his mainland brother, Hiram Clay Kellogg, to survey the area as the site of a potential reservoir. He also turned to the Waialua Sugar Plantation to help finance a reservoir project and be a customer of the water after the dam was built. Once the survey was completed, LG called on James Dix Schuyler, a prominent consulting engineer from Los Angeles. Schuyler recommended a dam structure that used a combination of rock fill (loose boulders packed together) and hydraulic fill (soil that is moved into place and compacted by water). Clay was hired to do the detailed plans for the dam and to supervise its construction. Although officially named Wahiawa, the dam is also known as the Waialua. It was constructed at a fork in the Kaukonahua River, backing the water up into two separate valleys to form what may have been considered two reservoirs, implying two separate dams. Construction began in 1903 and was completed in 1905. The logistics of the construction were challenging. Railroad track was laid for bringing in the boulders for the rock fill portion from as far away as 6-miles. A high trestle was built over the dam site, and the rocks were dropped into place. The long drop compacted them so they held in place. At its completion, it was the highest dam and largest reservoir in the Hawaiian Islands. The dam rose 98-feet above the stream bed, was 460-feet long and 25-feet wide at the crest, and 580-feet wide at the base. The original capacity of the reservoir was 2.5-billion gallons. It cost $300,000 to build, and was considered something of a bargain. The water from the Wahiawa dam was transported to the higher cane lands of the Waialua plantation by means of tunnels and ditches and reduced the cost of water from an average of $63-per acre to about $20-per acre. It will also served lands between the 700 and 400-feet levels which could not be supplied by pumps for less than $90 to $100-per acre. The water supply feeding the reservoir was ample to fill it from 4 to 6-times per year; with rainfall distributed throughout the year, the reservoir was refilled in rapid succession as it is emptied. The average depth is 26-feet, with the maximum depth of 88-feet at the dam. Since 1957, the Department of Land and Natural Resources, through a cooperative agreement with Castle & Cooke, Inc., has managed Wahiawa Reservoir as a public fishing area. In 1968, a 14-foot wide concrete boat launching ramp and parking area were constructed by the State for public use. The reservoir is stocked with both large and small mouth bass, bluegill sunfish, Channel catfish, Threadfin shad, tilapia, peacock bass, oscar, Chinese catfish, and carp. It is the responsibility of DLNR’s Division of Aquatic Resources to manage these gamefish populations within the reservoir for recreational fishing purposes. In 1999, the invasive aquatic plant, salvinia molesta, invaded the reservoir; within months, its growth exploded to a point in 2003 that it covered 95% of the reservoir’s surface area. Salvinia molesta is a plant that under ideal conditions will double in number in 2-3 days and double in volume in 7-10 days. Apparently, little was done to stop it. In addition to other concerns, at risk was a die-off of 500-tons of fish. 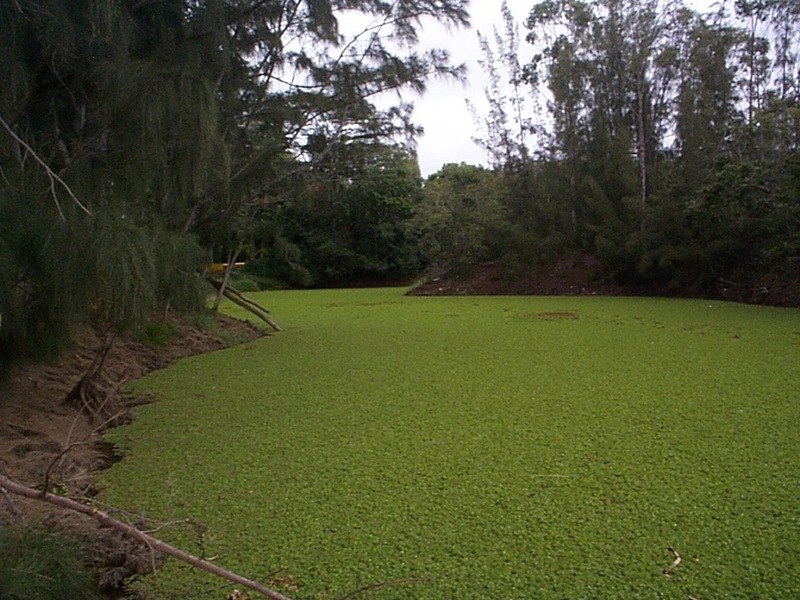 In the first month of my service at DLNR (January, 2003,) I asked our Chief Engineer (Eric Hirano) to prepare and oversee a plan to rid the reservoir of salvinia. By May 24 2003 (after approximately $1.7-million,) DLNR reopened the popular state park for public use of shore portions. The image shows a ‘before’ image of Lake Wilson, covered in salvinia (that’s not a meadow, that’s a lake.) In addition, I have included other related images in a folder of like name in the Photos section on my Facebook and Google+ pages.